Black eyeliners are always our favorite no matter which attire we wear or whatever the occasion is, a black eyeliner is always at our rescue. I have been using Lakme Insta Liner for the longest time and although I did try out various black liquid liners from other brands, I have somehow not found them to be as good as Lakme’s, as it was good in every way, be it the applicator size or pigmentation or quantity! When Lakme introduced Lakme 9 to 5 Black Impact Liquid Liner, I was very tempted to try it out and hence I brought this one. So without much ado, I would like to present my review on Lakme 9 to 5 Black Impact Liquid Liner. Availability: Lakme 9 to 5 Black Impact Liner is available easily at all Lakme counters and online as well. This rich, intense black liner makes your look last longer with its silky, water-resistant & fast drying formula, giving your eyes a bold and dark impact to make that lasting impression. The brush handle offers a comfortable grip so you can create dark, dramatic eyes that are a night time glam staple. 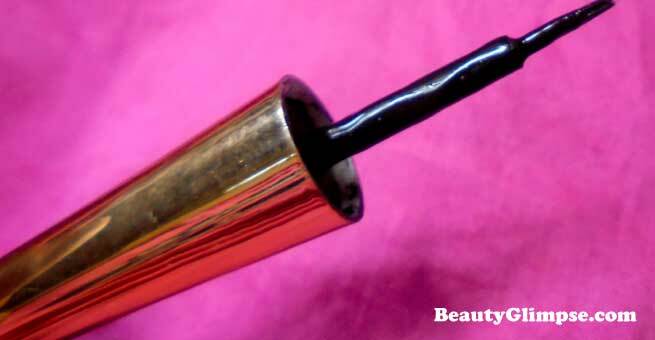 Packaging: Lakme 9 to 5 Black Impact Liners comes in a soft pale pink plastic bottle with golden inscriptions and the applicator is golden, long and tapering. Very travel friendly, light and pretty. My take on Lakme 9 to 5 Black Impact Liner: If the applicator of an eyeliner has fine and long bristles, I am sold! The reason being- if the applicator is good then applying eyeliner becomes an easy job. Coming to the matter of everyone’s interest- the eyeliner is much pigmented. It is a deep black and this I say in comparison to the insta liner from Lakme. 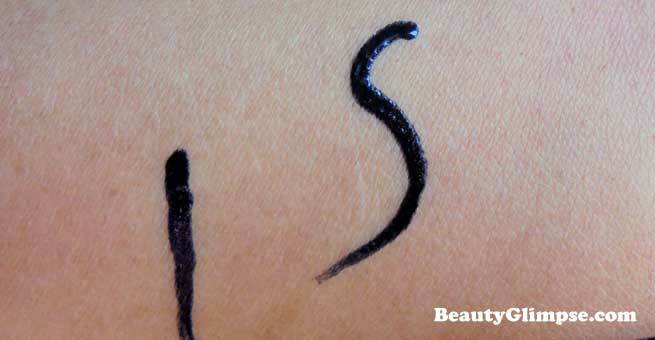 The consistency of Lakme 9 to 5 Black Impact Liner is creamier and thicker as compared to Insta liner. The application with this liner is very easy; you can draw super thin line and winged eye easily as well. I would specially recommend this one to beginners as this will help them with perfecting the art of lining the eyes easily. It has pretty decent staying power and no smudging whatsoever. Removal of the eyeliner is also very easy; you can do so with a cleanser or just a regular face wash. So I can now say that I have found my favourite black liner as it overtakes my likeness for Lakme’s Insta liner. Final Verdict: Lakme 9 to 5 Black Impact Liner is definitely a good black eyeliner for the price. If you are someone who is just trying out eyeliners, then grab this one for sure, you will enjoy the learning process of eyeliner application. The others who like experimenting with different kinds of lining like winged eyes; the Lakme 9 to 5 Black Impact Liner is the best pick. 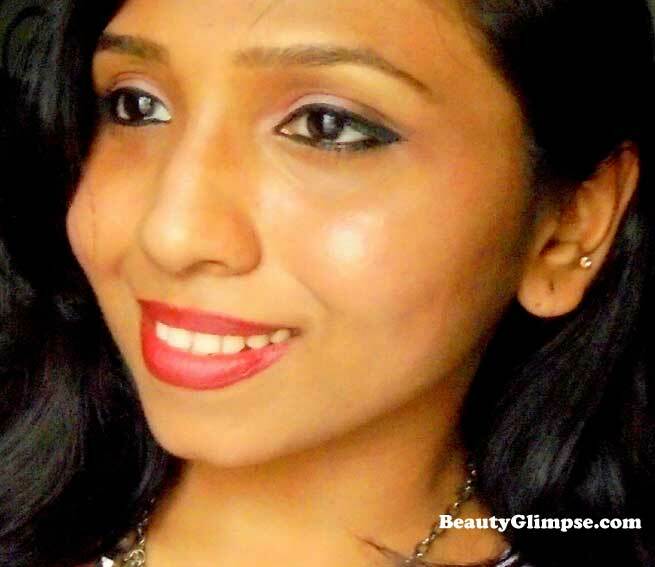 Also Read – Maybelline HYPER GLOSSY Liquid Liner- Got You On My Eyes! !